Welcome back. 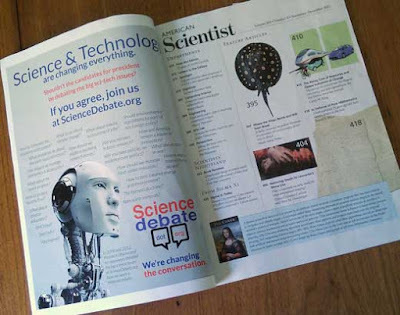 Thumbing through the latest issue of American Scientist, I noticed a full page ad from an organization I’d never heard of, ScienceDebate.org. “Science & Technology are changing everything,” the ad stated. in Sigma Xi’s American Scientist. I laughed before realizing it wasn’t a joke. Did they really expect our I’m not a scientist politicians--even those trained in science--to expose themselves? I looked at the organization’s website and that really got my attention. ScienceDebate.org and Research!America (no, the exclamation point isn’t a typo) recently commissioned a national public opinion poll of American voters’ views on science and the 2016 elections. To me, the poll results weren’t just unexpected, they were electrifying. Zogby Analytics conducted the online survey in September, sampling 1,002 voting age adults with a sampling error of 3.2%. There were only 10 questions. A few were general support for science, similar to the Pew Research Center survey I blogged about last March (Science and Society). Most questions focused directly on political candidates and science, with responses tagged by political affiliation. Can you believe that, on balance, Democrats and Republicans weren’t too far apart? Here’s a sample of some key results. Candidates should participate in a debate on key science-based challenges facing the US. Overall, 48% of those surveyed strongly agreed and 38% somewhat agreed. I’ll take that as 86% said yes. Way more Democrats than Republicans strongly agreed, yet the Democrats’ and Republicans’ combined totals for strongly and somewhat agree were close enough to be considered sampling error. Candidates for President and Congress should have a basic understanding of the science informing public policy issues. I thought this told more about the voters than their wish for a debate, and here again, 87% of those surveyed thought it was either very important or somewhat important. Although Democrats leaned more toward thinking it was very important, Republicans caught up if very important and somewhat important were combined. Public policies should be based on the best available science. Of those surveyed, 77% strongly or somewhat agreed, with the same pattern of more Democrats in strong agreement and the two parties’ combined strongly and somewhat agree being very close. Science should not be partisan (not the sole business of one political party or another). There was wide agreement on this statement, but the pattern flipped. Republicans were out in front of Democrats on agreeing strongly. That change could be interpreted in different ways, but since it’s a poll of voters, not Congressmen, I accept it at face value and think it’s promising. How well informed are you of candidates’ positions regarding policies and funding for science and innovation? Overall, 45% of the respondents felt they were very or somewhat informed, and that didn’t differ much for Democrats or Republican. It would be nice if it were higher; I hope it’s not really lower. I encourage you to review the survey results. You’ll find much more that I highlighted here. A big surprise to me, a lifelong Independent, is how Independents responded to the survey questions. I’ll comment on that next Tuesday. As for adding science to the presidential debate, I think it could be useful if measures were taken to present the scientific consensus and avoid or correct misinformation. It’s hard to know what viewers got about vaccines, autism and scheduling children’s immunizations from the Republican’s 2nd debate. Hey, that’s just my opinion. I’d like to hear yours. Thanks for stopping by.